One of the most specialized menu collections in the world must be the one maintained at the Archives of the Roman Catholic Archdiocese of Toronto (ARCAT). ARCAT maintains a website, the Archivist’s Pencil, which selects and discusses archival materials of all types from its records. A few years ago, it reproduced a half-dozen menus that commemorated celebrations or other special events in Archdiocese history. Here is one of them, from 1892. The celebration was clearly for a notable occasion, a double-Jubilee of the founding of the Toronto Archdiocese. This meant the menu was unusually lavish and it went yet further by featuring a wine selection. The other menus on the ARCAT website do not feature alcohol. I cannot decide if the spatial treatment given the three wines, sherry, Champagne, and claret, was intended to indicate the dishes they were meant to partner with. If so, the claret was meant for the dessert and fruit course, a seeming anomaly. Before readers exclaim that the spacing was surely a design decision, nothing more, one may note that in British dining then Bordeaux red wine was, or could be, drunk at the end of the meal. See this 1890s edition of Table Talk, where claret is advised for the cakes. So a possibility is, the clerics were served sherry with all courses after the soup until the game, then Champagne onwards until claret met the dessert. This is 1892, and might be considered late for such treatment as “red with the meat” was certainly well-understood by then. But given the meal occurred in remote (from England) Canada, and given perhaps too the intramural nature of an Archdiocese, an older custom may have been followed in the Catholic world. In contrast, the menu’s typographical design is rather modern, especially the right side where the foods are listed. That style would not be amiss today for some upscale restaurants in downtown Toronto. 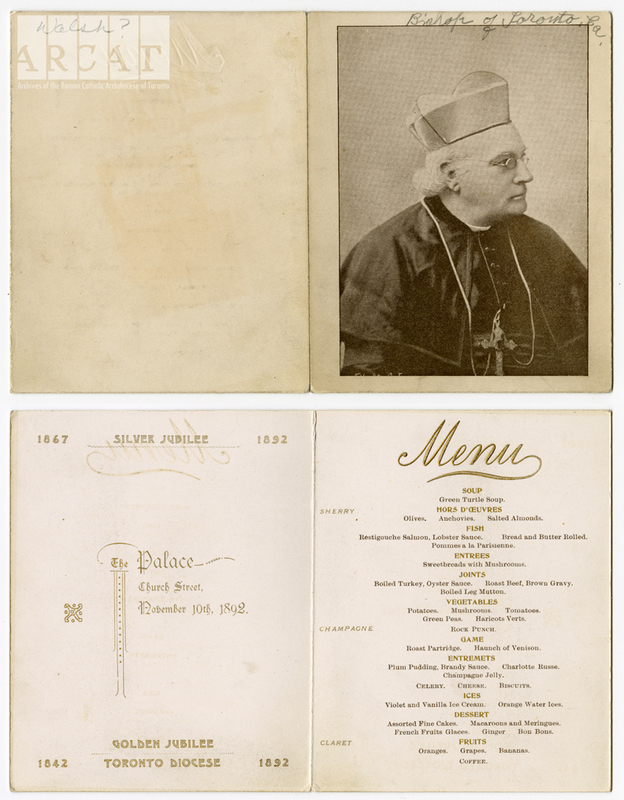 The dinner was held at the Palace, Church Street, Toronto. It sounds like a commercial hotel, but was not. 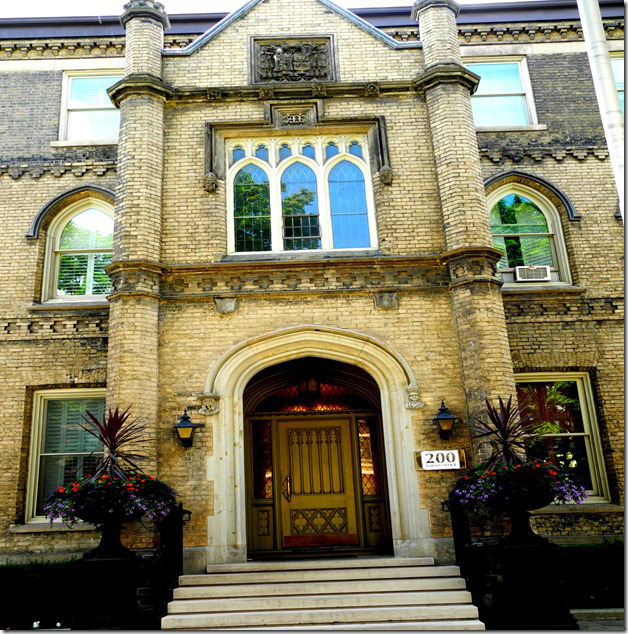 The Palace was the rectory for the Archbishop and Bishops of Toronto. Not only that, this fine example of Victorian Gothic is still standing, see below. The historical Toronto website, “Taylor on History”, from which the image below is taken, gives an excellent overview of its history and design features. The Palace must have had the dinner prepared in its own kitchen and perhaps sourced the wine from its own cellar. The food was what I would call prosperous middle class, not excessively ornamented and sauced (perhaps the sweetbreads apart), but offering solid choices like joints and fowl with minimal dressing, some game, and one fish. The inevitable Victorian turtle soup appears. The desserts do look nice, taken as a unit with the entremets and ices. The luxury was more in the choice of things to eat rather than elaborate recipes and presentation. Another modern touch is tomatoes as a vegetable. Up to the end of the 1800s this vegetable (or is it a fruit?) was usually restricted for ketchups and conserves. These tomatoes were almost certainly cooked though, not eaten raw. I love the violet and vanilla ice cream combination. Apart from the pleasing alliteration, the blending sounds enticing and even contemporary. Yet, together with the ginger and glazed fruits withal a Victorian atmosphere is conjured. And so we have the yin and yang of the familiar and the remote so often encountered in historical culinary investigation. Violet is the colour of some vestments, isn’t it? And of the wine used in sacraments? Here I will stop as I am entering territory quite foreign to me. Note re images: the images above were sourced from the websites identified and linked in the text. All intellectual property therein belongs solely to their lawful owner or authorized users. Images are used herein for educational and historical purposes. All feedback welcomed. Yes, Gary, violet (or what I called purple) is one of the colours of Roman Catholic priest outer vestments (known as chasubles), familiar to me in my youth as an altar boy. It symbolises Penance and Preparation and is worn during Lent and Advent. Other colours include green (used for most of the year), white (or gold), red and rose which also have symbolic meanings, and are worn at Mass for specific feast days or periods. Introduced by Pope Innocent III (1198-1216). Ah yes, the perks of being an altar boy – we also wore vestments of sorts (yuck!) but the good bit was sneaking swigs of red altar wine in the vestry (the changing room). The wine was especially made at Mission Wines in NZ’s Hawkes Bay (a winery attached to a seminary) and tasted quite horrible to a 10 yo. Without going too deeply into theology, the theory is that, the wine, once blessed at Mass turns into Christ’s blood by the magic process of transubstantiation along with the Host (unleavened bread) which becomes His flesh. Gulp! Once I tasted the blessed wine and realised it was the same as the unblessed, I realised the game was well and truly up. I always preferred the Anglican take which is that they are symbols of His flesh and blood. One thing is for sure – in Catholic society consumption of alcohol is certainly not frowned upon, indeed it is an integral part in most social events, or at least it was when I was a boy (1970’s). Almost all the priests I encountered in those days drank like fish and usually smoked like chimneys. God knows why.